"No, you don’t get to sit there and say that he hasn’t been racist when objectively, he has." 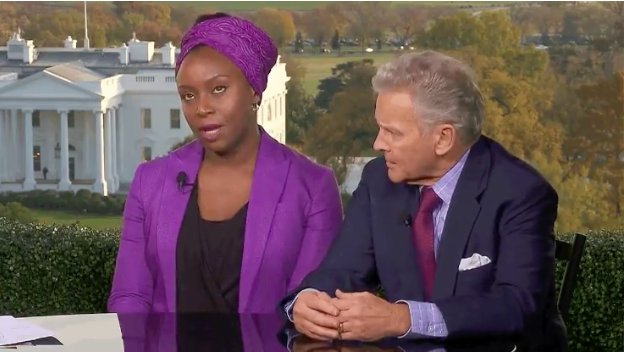 Nigerian author and renowned feminist Chimamanda Ngozi Adichie was on BBC Newsnight discussing the outcome of the American Presidential election with R. Emmett Tyrrell, editor-in-chief of a conservative magazine, American Spectator. During the discussion, BBC reporter Emily Maitlis noted that some Republicans like Paul Ryan have acknowledged the racist language President-elect Donald Trump tends to favor. Tyrrell immediately got defensive. "That’s not true. He hasn’t been racist," Tyrrell said, ignoring many of the racist things Donald Trump has said and done. Thankfully, Adichie corrected him, saying, “I am sorry, but if you are a white man, you don’t get to define what racism is. You really don’t." And although Tyrrell attempted to defend Trump, she brilliantly continued her shut down, "No, you don’t get to sit there and say that he hasn’t been racist when objectively, he has." She added that, "racism is an objective reality, and Donald Trump has inhabited that reality." You have to watch the whole thing for a lesson in how to speak truth to power. Did anyone notice her body language and deceptive smiles? She made valid points tho. But saying a white man doesnt get to define what's racist doesn't seem fair. She's probably referring to the concept of 'white privilege'. Most whites, especially males, don't understand the advantage they have over everybody else by being in the majority. It takes extraneous circumstances to see segregation when you are in the dominant class of the society. This lady is the ONLY reason why I don't want Biafra Republic despite them being my in laws numerous times. Nice. Pretty. Intelligent. Outspokenly quiet. Modestly dressed. These are the ones we should post stuff and talk about them, instead of Cossy and her likes. Have I digress from the topic? Seems yes. Ok, to the point... she's right of course! Their ancestors did everything they could to build a solid foundation for whatever privileges they enjoy today whereas our leaders steal everything we have and put them in European, Chinese or American banks and the funds are used to make those countries better for "whites". At the end of the day, whites have perfected the strategy of exploiting the blacks and other minorities to the extent that these minorities work hard to benefit the whites and do everything they can to ensure than their own races remain in poverty and mental slavery. Even Chimamanda will rather live in the US than here in Nigeria and most likely contributes more to the development of the US than Nigeria's. Get your shit_ together NL, already saw the video like 69 years ago...Chimanda is great at twisting prompts with unnecessary metaphors...Saying Racist Politically incorrect Statements doesn't necessarily make you a bad president in the making. Although Trump really is suspect. Chimamanda gave it to the man like it's hot. I don't know how someone will open their mouth and say Donald Trump is not racist, even if it's slightly. Donald trump is a racists and so those who voted for him knew he was a racists and they still decided to vote for him. any one who doesn't like it should leave American asap they are not forcing any one to stay in their country. 2 dates America/ns will never forget. 9-11: the day terrorist attacked USA. 11-9: the day D.Trump emerged winner of their election. Raine80 says I'm Donald Trump, now I feel hated. And everywhere I look I see people giving me the "ah go break ya head" face. I can literally feel the hate everywhere. Like when I took my shoes off under the scorching afternoon sun, the ground immediately started hating the soles of my feet; and when I sipped my boiling tea, the tea hated my tongue; and when I carried my aunty's baby, the baby shat on me; and when I danced to shoki in the middle of the highway, all the car horns started hating on me. This hate is becoming unbearable. Even Donald Trump says "Stop the hate", so Raine80, come and remove this Donald Trump spell o. Cao, Estharfabian, Ishilove, Ireneony, cutesexy1, please beg Rain80 on my behalf. go change your Virginia to penisss if it affect you so much! Infact Adichie know book wella. She get brin, she sabi tlk..dt oyibo n serious olodo talking with his mouth not from his sense even if he has. Trump is a bleeping racist, is that even debatable? No..
Raine80, come and remove this Donald Trump spell o. Once the spell has been cast it cannot be revoked. Trump's victory sure gave a lot of people bloodied noes. They find it really difficult to move on. Election defeat even to just emotional supporters, is now becoming a really painful thing. Trump's body language is already working. Many have missed the essence of what she was saying. 10 Nigerian Authors Whose Books You Must Read This Year / Maga No Need Pay / Why Do Most Nigerians Fail To Pronounce These Words Correctly?